Icy Arctic Variations in Variability | Watts Up With That? A while back, I noticed an oddity about the Hadley Centre’s HadISST sea ice dataset for the Arctic. There’s a big change in variation from the pre- to the post-satellite era. Satellite measurements of ice areas began in 1979. Here is the full HadISST record, with the monthly variations removed. Figure 1. Anomaly in the monthly sea ice coverage as reported by the HadISST, GISST, and Reynolds datasets. All data are from KNMI. Monthly average variations from the overlap period (1981-1994) have been subtracted from each dataset. All data are from KNMI (see Monthly Observations). There’s a few points of note. First, the pre-1953 data is pretty useless, much of it is obviously not changing from year to year. Second, although the variation in the GISST dataset is doesn’t change in 1979, the variation in the HadISST dataset changes pretty radically at that point. Third, there is a large difference between the variability of the Reynolds and the GISST datasets during the period of their overlap. Why did their paper bring this issue to the fore? Well, the problem is that the observations they use to establish their case are the difference in variability of the HadISST during period 1953-1979, compared to the HadISST variations since that time. They look at the early variations, and they use them as “a good estimate of internal variability”. I have problems with this assumption in general due to the short length of time (25 years), which is way too little data to establish “internal variability” even if the data were good … but it’s not good, it has problems. Second, from 1979 onwards the HadISST data set is primarily based on satellite observations. We find across the 1978/1979 boundary an unusually large increase in sea-ice extent in March and an unusually large decrease in sea-ice extent in September (Figures 1b and 1d). This indicates a possible inconsistency in the data set across this boundary. Figure 2. As in Figure 1, for HadISST only. The inconsistency is clearly visible, with the variability of the pre- and post-1979 periods being very different. As a result, what they are doing is comparing apples and oranges. They are assuming the 1953-1979 record is the “natural variability”, and then they are comparing that to the variability of the post-1979 period … I’m sorry, but you just can’t do that. You can’t compare one dataset with another when they are based on two totally different types of measurements, satellite and ground, especially when there is an obvious inconsistency between the two. In addition, since the GISST dataset doesn’t contain the large change in variability seen in the HadISST dataset, it is at least a working assumption that there is some structural error in the HadISST dataset … but the authors just ignore that and move forwards. Finally, we have a problematic underlying assumption that involves something called “stationarity”. The stationarity assumption says that the various statistical measures (average, standard deviation, variation) are “stationary”, meaning that they don’t change over time. For the long-term memory process, we estimate the Hurst coefficient H of the pre-satellite time series using detrended fluctuation analysis (DFA) [Peng et al., 1994]. Only a rough estimate of 0.8 < H < 0.9 is possible both because of the short length of the time series and because DFA shows non-stationarity even after removal of the seasonal cycle. Unfortunately, they don’t follow the problem of non-stationarity to its logical conclusion. Look, for example, at the variability in the satellite record in the period 1990-2000 versus the period 2000-2005. They are quite different. In their analysis, they claim that a difference in variability pre- to post-1979 establishes that human actions are the “external driver” … but they don’t deal with the differences pre- and post-2000, or with the fact that their own analysis shows that even the variability of the pre-1979 data is not stationary. Finally, look at the large change in variability in the most recent part of the record. The authors don’t mention that … but the HadISST folks do. In any case, when I put all of those problems together, the changes in variability in 1979, in 2000, and in 2009, plus the demonstrated non-stationarity pre-1979, plus the indirect evidence from the GISST and Reynolds datasets, plus the problems with the satellites affecting the critical recent period, the period they claim is statistically significant in their analysis … well, given all that I’d say that the N&M2012 method (comparing variability pre- and post-1979) is totally inappropriate given the available data. There are far too many changes and differences in variability, both internal to and between the datasets, to claim that the 1979 change in variability means anything at all … much less that it reveals an “external driver” for the changes in Arctic sea ice. Obviously another example of groupthink analysis by an unsupervised graduate student. Forward! “Ya think? I love these guys, “possible inconsistency”. The use of this kind of weasel words. like “may” and “might” and “could” and “possible”, is Cain’s mark on the post-normal scientist. Let me tell you an issue I’d like to see someone look into … I find it funny that the variability of the arctic ice between 1997 and 2007 seems awfully constant and compressed when compared to 1979-1997 and 2007 to present. Though it does make a nice tight trend downwards .. the variability just seems very uncharacteristic when compared to the rest of the record. Kinda makes me think that the data has been cooked. Now .. that couldn’t be .. I mean the CAGW crowd would never cook the data … right?? There could be a man-made external forcing. Check NoTricksZone tomorrow. You’ve all heard of the 350 org, I hereby announce the 500 org. Admittedly, though, N&M2012 asserts that their purported negative, linear trend is across the entire sample time period – on the presumption the pre-satellite and satellite data reported similar magnitudes attributed to internal variability. However, Mr. Eschenbach presented a strong argument that the collection methodologies associated with the two data sets render subsequent comparisons largely suspect. Which narrative would you regard as more accurate – (a) the paragraph you read without your glasses in which you confidently reported seven out of every ten words (due to the blur factor) or (b) the paragraph you read with your glasses in which you confidently reported ten out of every ten words (due to the clarity factor)? Now, add a gouge to the glasses (i.e., a recent and significant degradation in performance) after the dog knocked you over with one last sentence to read and even this accuracy decreases, as well. Common sense, albeit subjective, suggests that any comparison between the two data sets must default to the use of a broad brush rather than a narrow, more precise one (Monte-Carlo simulations notwithstanding due to the lies, damned lies, and statistics factor). Not really. Having written my share of scientific reports, I can say that those words are part of the normal lexicon. It is the absence of those words, not their presence, that identifies pseudoscience. The disconnect lies in skipping from a scientific paper directly to policy, conveniently omitting the qualifiers to achieve the desired result. But I agree; the paper is severely flawed, as you state. . Notz & Marotz note a discontinuity, assume that it represents human effects, base their analytical statistics on short-term data before the discontinuity, then cite the short-term post-discontinuity data as proof of human effects. This is nothing more than a fanciful way of begging the question. Worse, they attribute the presence of a sudden discontinuity to human CO2 emissions, though the latter are gradual and the former is abrupt. This is post-doc, post hoc thinking, proof that they’ve assumed an understanding of the Arctic ice system that they don’t really possess. Too much grant money, chasing too few opportunities for real climate science. The 2007 onwards increase in variability does seem a real phenomena resulting from increased ice ‘melt’ and increased ice formation on an annual basis. I disagree. A scientific statement would be something like “the value of the variable is 3.6 ± 1.2 units (one standard deviation). The corresponding pseudo-scientific statement is “the value of the variable may be greater than 6”. Both statements could be true. The value could in fact be 6.5. But only one of the statements is science. I see this all the time, in forms like Hansen’s infamous claim that the increase in CO2 could lead to a 20 metre increase in sea level by the end of the century. Well, yes, it could, and I could win the lottery tomorrow, but that’s not science. Science is generally distinguished, in fact, by the use of error estimates rather than weasel words like “may occur” and “could lead to”. However, Jorge, I do agree with you that “those words are part of the normal lexicon”. The human drivers in this case are the “scientists” playing with numbers. Crunch ’em this way, then crunch ’em that, until the only “logical” explanation is fumes from their Cadillacs. Willis is quite correct here in both his analysis and in the lexicon of science speak. My take on it it is simply another run as making the data fit the theory. the pre-1953 data is not pretty useless. The artificial step change in the early 50s stands out so obviously, that its use is clear: cheat. Another artificial step change may be around 1973, perhaps inserted with an instrument change, but as always in the direction to support alarm. This is brilliant — it dismisses the statistical analysis used in a peer-reviewed paper in a prestigious journal without actually doing any statistics! Only a man without the intellectual blinders of advanced degree in science, without experience in scientific research, or any without any kind background in mathematics more advanced than algebra could so effortlessly dismiss the scientific work of a couple of egghead PhD research geeks. We should all reread D&K (2000) and pondor admiringly on Mr. Eschenbach’s achievements in science and statistics. Nice work again. And your conclusion that the changes in the time series are the results of changes in measurement techniques and changes in instrument performance, not CO2 forcing or any other global warming terminology appear logical and supported by the data. The authors’ rush to man-caused change is simply not evident in the data. Again, nice work and thank you for all your hard work in our behalf. This is brilliant — it dismisses the statistical analysis used in a peer-reviewed paper in a prestigious journal without actually doing any statistics! People don’t realize how much poor or bad science gets published. A prominent scientist I know very well, who evaluates published studies for the purpose of formulating public policy tells me that most of the published studies in his field are worthless. Specifically, the conclusions they draw aren’t warranted by the data they present. Which, in a nutshell, is Willis’s critique above. Ah, yes, the argument from authority. Please notice, folks, that it appears he cannot find any errors in my logic or my facts or my claims. As a result, he is reduced to saying but, but, but the authors have PhDs! It’s peer reviewed! The journal is prestigious! All overlaid with a thick coat of satire. My achievements in science and statistics are a matter of public record, both in the peer reviewed journals and here on this blog. I have four peer-reviewed publications in the scientific journals, including a peer-reviewed “Communications Arising” in Nature magazine. They had no problem with my qualifications or achievements. Regarding my math-fu, it’s strong, and there is always more to learn. I got credit for a year of college calculus when I was still in high school, and never looked back. I wrote my first computer program in 1963, and have continued programming to this day. And yes, I do make stupid math errors sometimes, and when I do, it’s very public. The Argus-eyed intarwebs assure that I get called on it and admit it and continue to learn. But that’s not the point, peter. It’s not about me … and it’s not about the authors or the journals either. It’s about the science, the ideas. Nothing else matters. Doesn’t matter who said it, doesn’t matter if they wrote it on the bathroom wall. All that matters is, is it true? Is it consistent? Does it hold up under attack? Notice, folks, that peter cannot find any fault in the actual science and statistical concepts and arguments that I have presented here. peter, my statistics are reasonably good, but the underlying problem with their analysis is not statistical. Or rather, the problem is statistical but it lies in the area of the logic of statistics, rather than what you call the doing of statistics. That’s why I’m not “doing any statistics”, even though I can do them. That’s not where the problem lies. You can’t draw any conclusions from comparing the variations of two such datasets. It’s a fools errand. There is no reason to assume that the mean, variance, or distribution of the two are related at all. They may be related, but if they are not, this does not “reveal an external driver”, that’s nonsense. Finally, appeals to authority such as you have made above, even if they are as clever and sarcastic as yours, don’t get any traction here. At WUWT we do science. If you have objections to my science, to my logic, to my data, to my mathematics, to my statistics, then QUOTE MY WORDS THAT YOU OBJECT TO and explain my error, which I know to be manifold. Brilliant is perhaps an over-statement but it is a very good article by Willis. He does not dismiss that statistical analysis itself, he is quite clearly showing why any such analysis is invalid before it is even calculated because the data are incomparable AND are explicitly said to be so by the authors that publish the data. Not only is this paper flawed science , it is knowingly flawed and hence dishonest science. If GRL was as “prestigious” as you suggest, they would not publish such obviously false rubbish. so the pre-satellite steady ice extent is nonsense. 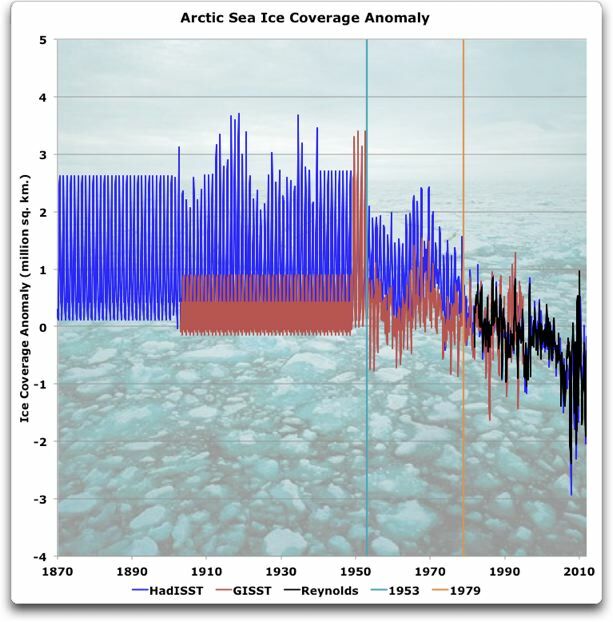 There is a study which observes Barents sea ice following the AMO in the same wave pattern. One hint – NW passage was open in 1942-44 and then only in 2007. Both on the top of the warm SST peaks. On the contrary, Peter. What this case shows is the worthlessness of peer review – how was it that none of the peer reviewers picked up these relatively straightforward problems? You’d expect the peer reviewers to be knowledgeable about the subject matter of the paper, right? In which case, you’d also expect them to be aware of the available datasets, right? If so, shouldn’t they have been asking the quite basic questions that Willis has asked here? And at least requiring the authors to address those questions properly? This kind of paper simply brings the whole system into disrepute. This makes the case for the abandonment of peer review for something more open, where anyone who is interested can make open comments on a draft paper for all to see and where the authors’ response is also done openly. The true spirit of open enquiry. Willis pins the issue brilliantly as usual. The big problem for the peter-warmists of the world is that they have so few real world data they can hope to conjour into a form that even remotely looks like it supports the failed CAGW hypothesis that they feel absolutely compelled to defend this type of Post Normal Science (PNS) to the last man as it were – because if they don’t they know the entire edifice of “evidence” will disappear in a flash of light and puff of smoke. The Shakun et. al. paper delusion falls into the ‘same sh*t different shovel’ category in its shameless cherry picking of proxies, as does the entire contorted, twisted and battered land-based temp record, the entire catalogue of IPCC spin, the various attempts by Santer and friends to cover for the missing ‘hotspot’ using wind shear measurements in preference to radiosonde thermometer readings, the Mann-schtick trick flick etc.etc. peter, are you not in any way embarrassed by your ‘play the man’ attacks? Do you really have such little sham and insight? And you cultists wonder why people generally have become so suspicious with your entire story-line. First of all, the referenced paper is completely wrong about the “beginning” of the satellite era. There is an almost continuous record of Arctic and Antarctic ice from satellites,stretching back to the early 1960s’. My team has personally helped the NSIDC with Nimbus I, II, and III HRIR data. Beyond that, it has recently been discovered that there is a film copy of the Nimbus AVCS (visible light) images. We need to put this 1979 boundary crap to bed. Makes me wonder if we have almost exhausted the limits of truly extraordanary scientific discoveries? So they are having to make stuff up to keep winning prizes and getting money off the gullable. Most branches of science seem to be at the same place, few to no new dicoveries, just the occational improvement, occational backward steps. Part which intrigues me is the statement from the ‘HadIIST folks’ that SST are ‘SSTs are estimated from the sea ice concentration’. By concentration do they mean thickness or extent or a combination of both? Does this take account of wind driven ice piled thicker or more closely driven together and changing the extent? If th temperature of the sea is 0.5 or 1 deg C colder or warmer than the overlying ice – that wouldn’t seem to figure in their calculations so how do they correct for that? Is it simply more of the guesstimation that seems to be a theme of the Post Normal Science philosophy that too many climate scientists seem o be adherents of ? Willis said Well, the problem is that the observations they use to establish their case are the difference in variability of the HadISST during period 1953-1979, compared to the HadISST variations since that time. What IS the “difference in variability of the HadISST during period 1953-1979, compared to the HadISST variations since that time”, as reported by the paper, Willis ? Hint : answer is on page 2 of the paper. And while we are at it, where in the paper did you see that this difference is relevant “to establish their case” ? Peter, This is brilliant – it dismisses the statistical analysis used in a peer-reviewed paper in a prestigious journal without actually doing any statistics! It’s not just that Willis does not use any statistics at all. The bigger problem is that Willis seems to be completely clueless about the data analysis used as a basis for the conclusions in this paper. It’s almost as if he deliberately avoids the statistics and data analysis, and instead pretends to reveal issues in the various climate records, even though these have already been addressed thoroughly in the paper. Dennis Ray Wingo, would you care to share some of that pre-1979 data with us ? 1979-2008 is used as anomaly mean there – which means anomalies are artificially minimized for this interval. Anything outside that interval is going to have increasing anomalies unless the system is stationary. Pre-satellite era is characterized by way lower certainity of results. Someone here recently stated that it’s not science if there are no error bars. I’m missing them in these graphs. And regarding the recent change, I wouldn’t blame the satellite too much. The change did not start in 2009, it started in half 2007 and in 2009 it was going on for two years already. It would be sure interesting to find a satellite problem causing it as it was rather abrupt but I don’t see any mentioned here. Quite likely the 2009 satellite measurement error is order of magnitude smaller than the real change which occurred. Very neat. 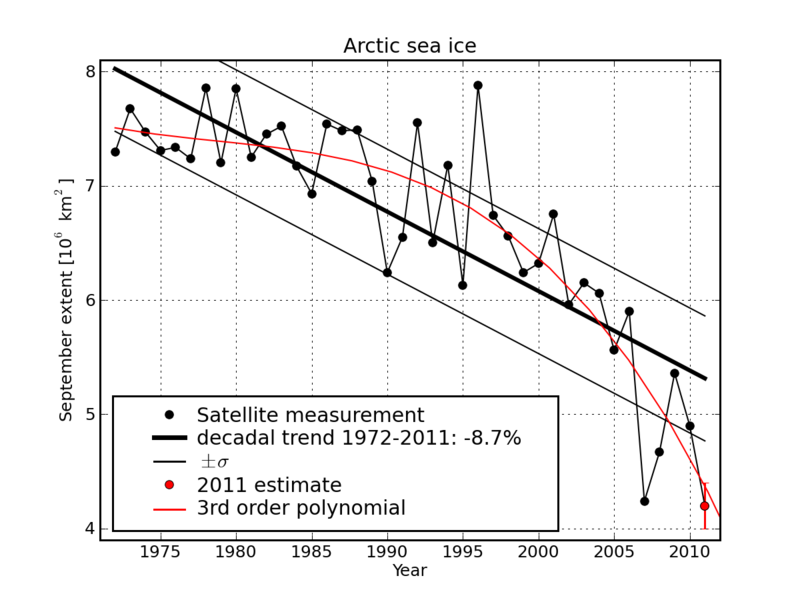 The paper should have been called Observations reveal discontinuities for Arctic sea-ice. What a surprize ! More garbage in yields more garbage out. Who would have thunk it ? The problem with any kind of measurement of reality is ALWAYS estimating how close to reality one is approaching. All experimental and field scientists worth their salt understand that statistically validated data is required in order to yield estimates that at least approach reality. Only climate scientists and charlatans seem to be able to blow smoke up everyone else’s butts about the probitive statistical validity of a sample size one ONE. A sample size of ONE. That’s the takaway from all this….. One thermometer (forget that the types change over time), one satellite (forget about the fact that serial satellite comparisons show their internal / external inconsistencies), no replicates, no random sampling, no field validation of remote sensing data nor proper calculation of stats, nor estimation of the size of instrument error, etc. It is important not to confuse satellite ‘imagery’ from visible and passive microwave. Passive microwave retrievals started in 1979 but visual images from satellite started earlier. Well, the problem is that the observations they use to establish their case are the difference in variability of the HadISST during period 1953-1979, compared to the HadISST variations since that time. Hint: the difference in variability is meaningless. We find that the available observations are sufficient to virtually exclude internal variability and self-acceleration as an explanation for the observed long-term trend, clustering, and magnitude of recent sea-ice minima. What do you think they are talking about if not the difference in variability? Or see e.g. Section 3, called “Internal Variability”. What they are doing is showing that the variability of the later period exceeds the “internal variability” exhibited by the earlier pre-satellite period. You sure you read the paper? It’s all about variability, that’s what they are using to make their case. Rob, let me try explaining the underlying problem again. It’s as though they estimated a sample of people’s weights by looking at the size of their pants, and then they estimated the weights of another sample of people by looking at the size of their shirts. Then they say that because one sample exceeds the “internal variance” of the other, it shows that there is an “external driver” making them different. You still don’t seem to grasp the nettle—you can’t simply grab two datasets from different ways of measuring something, splice the two datasets together, and then claim that the difference between the two is meaningful. This is brilliant – it dismisses the statistical analysis used in a peer-reviewed paper in a prestigious journal without actually doing any statistics! No, the issues haven’t been “addressed thoroughly” in the paper. They have been mentioned in the paper. Where, for example, have they “addressed thoroughly” the issue of non-stationarity? Yes, they mention it, but that’s all they do. And some issues are not even mentioned, like the satellite problems in the recent data. You have the same problem that Peter had. You are happy to accuse me of a variety of sins, but you say nothing about what I might have done wrong. Rob, I ask of you what I asked of peter. If you disagree with something I’ve said, stop prancing around asking Socratic questions and going hint hint. If you disagree, QUOTE MY WORDS and explain exactly why they are wrong. Finally, you seem to think it’s a crime that I haven’t gone into the statistical nuts and bolts. There was no need to, since the underlying premise was flawed. But if you like statistical questions, how about this one. They assume that despite the fact that they find the pre-1979 records to be non-stationary, that they can estimate “internal variability” of the system from that short 25-year record. Given what we know about the general long-term variability of the climate, and the known existence of ~ 60-year cycles in the Arctic temperatures, and the fact that they themselves say the pre-1979 dataset is non-stationary … what are the error limits on their calculation of “internal variability”? And given those problems and the shortness of the record, can the errors on their “internal variability” even be calculated? Thanks, Dennis. If you have citations to that earlier data it would be great. The data used for the Northern Hemisphere fields were as follows: (1) 1871–1900: a calendar-monthly cli- matology of adjusted mid-monthly Walsh data (see section A1.2) for 1901–1930. (2) 1901 to October 1978: mid- monthly adjusted Walsh data. However, fields for the period 1940–1952 were set to the calendar monthly 1940–1952 climatology, as the Walsh data set appears to be a sequence of two different climatologies during that period (Figure 1). (3) November 1978 – 1996: monthly median bias-adjusted GSFC data. Fields for the SSM/I data-void of December 1987 and January 1988 [Cavalieri et al., 1999] were filled by linear temporal interpolation of anomalies for the previ- ous and following months, and adding the result to the 1978–1996 climatology of the bias-adjusted GSFC data. (4) 1997 onward: monthly median bias-adjusted NCEP data. Note that it is non-satellite data up to November of 1978, and satellite data thereafter. That is why they can refer to the “satellite era” starting in 1979. In a more general sense, I think that “satellite era” in reference to 1979 means the start of continuous observations by satellite. As far as I know, the earlier Nimbus satellites, although quite useful, didn’t provide a continuous record. For this latter period, we use satellite observations collected in the NSIDC Sea Ice Index [Fetterer et al., 2002, 2010] (“satellite NSIDC record” in Figure 1). We use the NSIDC record rather than the HadISST record from 1979 onwards because the NSIDC record provides a more consistent interpretation of the satellite period [Meier et al., 2007]. For those insisting that they need statistics, I note that the authors have not provided any statistics or any sensitivity analysis justifying this choice of one of the two satellite datasets, or demonstrating its effect on the final result. I agree with William on this particular criticism (which does not distract from the thrust of your article as a whole). That said, I think your article raises some interesting issues and suggests flaws in the methodology used in the N & M paper. Unfortunately, no great surprise to see that data is being improperly handled. Willis, when you write them I can follow them, pure genius, you should be President. As with everything else AGW the paper described here hits another nail on the head. Obviously sea ice is diminishing due to mankind’s activities: in this case they have uncovered the nefarious effect of a man-made satellite on the entire Arctic’s stability. Schrödinger and his cat would be proud, if we could only see them. On the other hand, maybe this is just one more for Maurizio Morabito’s list of fortuitously timed observations. We switched to satellite observations in exactly the same month that natural variability was overrun by man-made forcing! What luck! There is a significant divergence between non-satellite (including visible derived satellite) and satellite passive microwave Arctic sea ice measures. There are also different trends between satellites with decaying orbits (DMSP) and controlled orbit (AQUA). Before anyone jumps to conclusions, GISST stands for Global sea Ice and Sea Surface Temperature. It is a product of the Hadley Centre, not GISS. 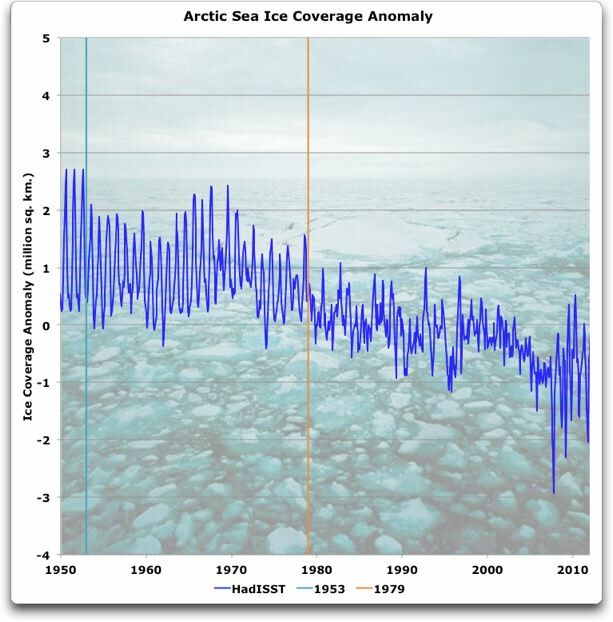 Willis: hadisst and gisst are not sea ice records in themselves. They collect other sources of ice information. If you want to do you analysis of sea ice information with primary ice data, you want NSIDC, not hadisst or gisst. Although I wouldn’t trust any of it to not be more subtly *adjusted*, what they did for the pre-1950 part of the graph is even amazingly blatant. I’ve saving this graph as an example. Peaks/troughs in exactly flat lines unchanging over decades never exist in the real world if one knows anything about weather and climate, how such is never exactly constant. (If they want to pretend zero data, although that isn’t really true, then they have no justification for depicting that time period at all within their graph). as warm or warmer in a peak in the 1930s than in the late 20th century) as well as sea ice maps discussed at the recent http://wattsupwiththat.com/2012/05/02/cache-of-historical-arctic-sea-ice-maps-discovered/ article. In one way, this makes sense. Someone like me or almost all other skeptics would never even consider trying to enter the field and get employment at institutions like that in the post-Mann-era, because we know we would never fit in and not be penalized, whereas the kind of ideologues who do not mind dishonesty for the cause of some environmentalists have increasingly gravitated towards them. Almost anything on climate published in the late 1990s and beyond, especially that published in the past several years, has to be double-checked for likely intentional skewing (not always but far too often). In contrast, though, one can relatively trust any older scientific publications up to around the 1970s at least. 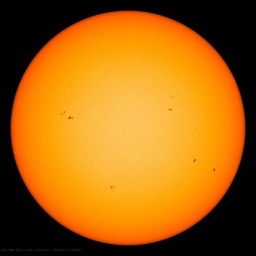 At this point, I think the world essentially needs the uncertain but possible scenario of solar cycle 24 after its peak declining over subsequent years into a Grand Minimum with severe temperature drop over most of the next dozen or so years (aside from short fluctuations on the scale of one to several years at a time from ocean variation and other precipitation-temperature fluctuations like El Ninos versus La Ninas), to destroy the spread of corruption. Well, there we have it. I guess I haven’t been gaining weight! Thanks Willis! There is a difference between your absolute weight gain and the variability of your weight gain record from one measurement system to another. It is the accuracy of the measurement of this variability that is the point of the discussion and the basis for the claims in the subject article. No Peter, you don’t understand what “different types of measurements” means. The proper analogy would be that you “measured” your weight until 1978 by using a measuring tape and recording the circumference of your thigh, and then from 1979 on, you switched to a digital scale to weigh yourself. Since your thigh circumference did not increase with your weight gain (because it was all going into your belly), you conclude with near certainty from your measurements that you started gaining weight in 1979 and it must be due to AGW. Don’t mind me. I’m trying to stop the emails about follow-up comments I keep getting from this thread. I’ve tried a number of other things and none have worked. I checked the interannual std.dev. in the HADISST ( downloadable from here http://climexp.knmi.nl/get_index.cgi ) and calculated the year-to-year differences. Before 1953 the data are not useful for calculating the variability (differences 1945…1953 are zero! ), this point is reflected correctly in the paper ( Introduction, point 6). Anyway, from 1953 to 1965 the differences are much more tiny than in the years after 1964 so one can say, the data from 1953 to 1965 are some kind of suspicious. From 1965 on the data seem to be useful for calculating the variability. This is consistent with your statement. So the paper should have used only data from 1965 on. …cause we had satellites and computers to measure that sea ice before 1953. That data is a waste of time. Check NASA SP-489 for the years 1973-76. Nimbus 1, 2, 3, and 4, have records as well as other satellites. We have done the work just for the HRIR data for these birds. The AVCS images are being scanned even as we speak. While no one satellite has a continuous record, if you paste all of them together the record goes back quite far. There are papers on this from the AGU. I don’t want to steal anyone’s thunder from the NSIDC as they have done a major service in this area. An addendum is that the HRIR images are worth far more than just the ice. We have been able to track mid 1960’s hurricanes and the first calculation of the global heat balance was done using Nimbus II HRIR images. In my opinion, a very good scientific study of the configuration of the atmosphere in the colder conditions of the mid 1960’s and compare that with the 70’s, 80’s, and through today would provide major insights into atmospheric circulation, rainfall patterns, and actually allow some really good predictions of weather based on global temperatures…. Didn’t know Sputnik I measured sea ice and it was the first to orbit Earth in 1957. Or was it the monkey on the Jupiter launch in 1959? What satellite was in 1953? Not all “space launches” reached orbital velocity which is required to be considered a “satellite”. The data graphed on the page looks pretty consistent to me, contrary to Eschenbach’s impression. Somehow, I get the feeling that if the authors of the paper on sources of variability came to the conclusion that internal variation was the main driver of sea ice variation in both periods, Eschenbach wouldn’t be complaining about how awful the data looked to him. Willis: hadisst and gisst are not sea ice records in themselves. They collect other sources of ice information. If you want to do you analysis of sea ice information with primary ice data, you want NSIDC, not hadisst or gist. Much appreciated, Peter, but that’s not what they’ve done. They have taken one dataset, over a very short period, and made the claim that it represents “internal variability”. Since the length of the dataset doesn’t even cover even one half of the Pacific Decadal Oscillation, that procedure is equivalent to you weighing yourself for three months on a balance-and-counterweight scale with unknown accuracy while you were in high school … and then claiming ten years later that that record represents the “internal variability of your weight”. Then you weigh yourself on an accurate scale, and say “whoa, I’m outside the limits of the internal variability of my weight, there must be some external driver”. However, as with most metaphors, we’d be better off dealing with the actual situation rather than with some situation that might be kinda similar … so let me return to that. … given those problems, what are the error bars on their “internal variability”? Me, I’d say that there is no way to calculate those error bars from the data we have. We have no previous records of what happens to the Arctic ice when the PDO switches signs as it did around 1976, we have only one record, we don’t know how accurate it is … so we don’t have a clue what error in the internal variability might be. But heck, give us your statistical method for calculating that error, I’m most interested. Thanks, Eric. I’m not “trashing” the data. I’m pointing out that the data is not adequate or appropriate for the purposes to which the authors are putting it, which is a very different thing. the problem is that the observations they use to establish their case are the difference in variability of the HadISST during period 1953-1979, compared to the HadISST variations since that time. As to where in the paper it says the difference in variability is relevant, it is the point of the entire paper. It’s all about variability, that’s what they are using to make their case. What IS the “difference in variability of the HadISST during period 1953-1979, compared to the HadISST variations since that time” according to the paper, and where is your statistical assessment of that difference, Willis ? I hope that you understand that without an actual statistical assessment of the data at hand, your words are simply empty rethoric without scientific substance.. I don’t see the justification for trashing the NH sea ice extent data between 1953 and 1979. It seems to me that the data looks reasonable. Earth has been cooling since 1994. Average temps. in the atmosphere cooled down by about 0.2 degrees C since 1994. It is not much and it is a global average. In any case, using Welch’s t-test, the null hypothesis that the HadCRUT data 1953-1978 and 1979-1993 are from the same population is strongly rejected (p = 1e-17). That is not surprising in the least, because they were taken by different people using different means of measurement. Perhaps you can give us your estimate of the error in their claim that the early data can be used to predict the “internal variability”. Willis, you bring up an important point. When I was doing research on the frequency specificity of a toneburst used to measure the Auditory Brainstem Response, I wanted to know if the high frequency tone bursts that were created were capable of forcing the auditory pathway to recognize the center frequency of each tone. To do that we could not just pick human subjects randomly. We had to use young subjects whose auditory pathway was intact and whose noisy brains were capable of being quieted (mine was not one of those kinds of brains). We discovered that indeed, the tones were capable of causing the auditory pathway in the brainstem area, if it were intact, to respond to the center frequency of each tone in the standard measured way. It became incumbent on yet others to see if this were the case in a randomly selected healthy population regardless of whether or not they had “busy” brains. And then someone else had to come along to see if this method could detect hearing loss happening in a population too sick to respond to normal audiometric tests. You need to select the source of your raw data, depending on what you want to measure. If you want to measure apples, don’t start with oranges. Here is one of the datasets mentioned by Dennis Ray Wingo. 30 years of satellite records produced through the Nimbus satellites published in Geophysical Research Letters. I’m pretty sure this is their datasets here (monthly and daily extent, NH to 1972, SH to 1973). It won’t be exactly comparable to the current datasets but it is not much different. Followed a few more links from this and guess what. There are actual weekly gif images showing the ice extent back to 1972 produced by the US Navy Ice Centre. May 1, 1972 here (looks a little higher than today) Note that Dark Blue is under 15% ice coverage so would not be counted in today’s numbers. How about the Arctic sea ice minimum Sept, 12, 1972. I don’t know what you think, but this is very low – this is not much different than recent minimums. Put this is your bookmarks. Others may be available going back to 1933, 1953, and (believe or not 1750 and 1553) here. The HadCRUT3 variance of the early period is more than twice that of the period 1979-2006, with a large and very visible jump at the boundary. Thanks Willis. Thank you for showing that variability before and after 1979 is less than 0.35, which is, as I am sure you will acknowledge, minor compared to the difference in mean (of about 1.0). No wonder that the t-test shows that there is no way that the reduction in the mean is caused by chance (internal variability). Now, considering these variabilities you mention for the periods 1953-1978 and 1979-2006 as well as 2007-present, if there would be no “external driver” at all over the entire period, what would be the probability that the start of the record (1953) would hover around +1.0 mean, while by 1979 the mean would be around +0.6 and by the end of the record (say 2009-2011) the mean would be around -1.0 ? All just by chance ? If you don’t like the outcome of that probability calculation, then by all means, please present your own quantification of how this trends in Arctic sea ice extent over time can be brought within the boundaries of the variability that you already presented. By the way, Willis, your figure 1 is a bit confusing. It seems that you are showing monthly variablility for the pre-1953 period (sine wave varying over a 2.5 million km^2 span), but other periods (such as from 1995-2005) annual variability in your plot seems to be less than 1 million km^2, which is obviously unrealistic. You mention that you obtained your data from the KNMI, but I’ve been unable to reproduce your figure 1 (nor 2) from the KNMI data pages. Could you clarify exactly how you obtained your figure 1 for us ? Thanks. HADISST actually presents their sea ice data in a 2D gridded form, so it requires some work to put that in a graph. Now what is your argument again against this data set ? In any case, Rob, you keep insisting that we can splice two totally disparate datasets together, calculate the variability of one of the two datasets, and then claim that the result means something about the other dataset … I don’t know anyone (including you) who has provided a theoretical justification for that claim. ed caryl above refers to this post which notes that the hand-waving dismissal of SO2 as a GHG because of short residence time does not apply in Arctic Cold. In fact, none of the processes that strip it operate more than very slowly in winter. And winter is explicitly where the “warm anomalies” in the Arctic appear. An interesting side observation is that Antarctic winter warming is concentrated around large research installations — the sole source of winter SO2 there! A source of variance explicitly not excluded and falsified in the paper currently being dissected. Monthly average variations from the overlap period (1981-1994) have been subtracted from each dataset. This just gets more confusing. What are the monthly averahe variations from the overlap period, Willis ? Did you take the average variations in each month over the 1981-1994 period and subtracted that number from the anomaly plot for each of the other year’s anomaly numbers for that month ? Or did you take the average of all months variations in the 1981-1994 period and subtracted that single scalar number from points in each dataset ? Or did you take the monthly average variations BETWEEN the datasets and subtracted THAT for each data point ? Or did you subtract take the average variation for each month and subtracted that from the absolute ice extent numbers, to OBTAIN the anomaly plot ? Or something else completely ? Even figure 2 (which shows only the HADISST dataset) does not seem to follow from the KNMI (or direct HADISST) data, and I suspect that is because your poorly defined “Monthly average variations from the overlap period (1981-1994) have been subtracted”. I would really help if you could clarify EXACTLY how you obtained that figure 2. OK. I finally figured out how Willis created his figure 1 and 2 here. (don’t let the suffix fool you. This is really a (cgi generated) pdf file. This graph is not exactly the same as Willis’ figure 1 and 2 ‘variability’ plots, but it captures the main features (increasing variability before 1980 and after 1995 and rather small variability from 1980-1994) and many of the details (general shape and outliers, such as 2007). Maybe Willis can explain why some of the details (such as variability over the 1995-2005 range seems a bit higher than in his plot) still seem to mismatch. So, now that we can largely reproduce Willis’ plots, the question is really, what are we looking at here ? Well, for starters, the “variability” in Willis figure 1 and 2 is small during the 1980-1995 period, because he calibrated variability over that period ! So it was defined by Willis to be small during that period. Moreover, and this is where is gets better (or worse, depending on your opinion of what is a “fair” and “objective” scientific representation of data), figure 1 and 2 do NOT only show a plot of the (natural) variability that Notz and Marotzke were trying to determine, but because Willis took the anomaly over the annual cycle, he not just captures natural variability, but also the long-term change in extremes in the annual cycle ! 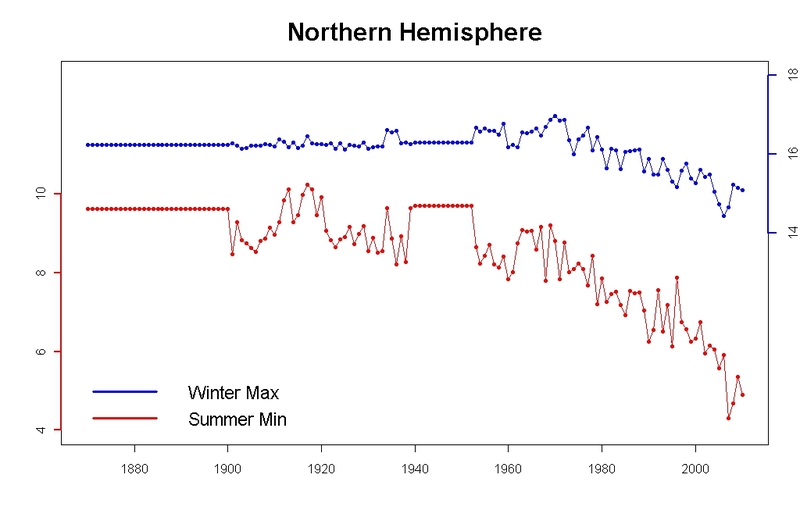 that the difference between winter maxima and summer minima increased slowly over time in the HADISST data set, and because of Willis choice of presenting the “variability” in Arctic sea ice, this diverging trend in seasonal cycle is now the main cause of Willis’ figure 1 and 2 increasing “variability” before 1980 and after 1995.
we now know that the “variability of the pre- and post-1979 periods are very different” mostly because Willis ‘calibrated’ the variability on the 1981-1994 times segment. Anything outside that period will show larger “variability” because of the diverging trend of sea ice maxima and minima over the seasonal cycle. So by choosing the calibration period carefully (right after the 1979 year) Willis created this difference of the variability pre- and post-1979 all by himself ! Ya think? I love these guys, “possible inconsistency”. The use of this kind of weasel words. like “may” and “might” and “could” and “possible”, is Cain’s mark on the post-normal scientist. into a completely different perspective. Not to mention the ad-hominem accusations that Willis was venting against the authors of this paper. Not to mention the OTHER ad-hominem accusations that Willis was venting against the authors of this paper. These turn out to be some strange form of phychological ‘projecting’, since YOU were the one comparing apples and oranges. This is the second time I catch you misleading your audience with deceptive representations and cherry-picked data. Wanna go for a third time ? I sometimes read Willis’s posts – they are long and full of colorful descriptions (although some might call it ad-hominem attacks) about other real scientists and topics and arguments on why he is a scientist (that he has four publications, although no one has cited any of them as far as I can see, including the one in Nature). Since, as it appears to me, his mind is already made up and he is looking for justifications for his position, I usually do not believe what he says. But please go a little easy on him. I like to continue to read his posts now and then – they are really fun to read. I do love it when some random internet popup without the courage to sign his name to his nasty allegations wants to denigrate my work … Nature magazine and other scientific journals have thought I was a scientist, they published my work, and I’ll take their word over that of some anonymous coward who attacks people from behind an alias. Since I explained it, you seem impressed that you can actually follow directions … my congratulations. Rob, you seem to think that you can take two datasets that are measuring different things, measured by different people, using different measuring tools, and draw conclusions from their variability. I can see there’s nothing I can do to change your mind regarding that question, so I guess we’ll just have to agree to disagree. that is not an ad hominem attack. You really should read up on the concept of “ad hominem” before making yourself look foolish. You may disagree with what I said, but I am not attacking the authors instead of discussing their procedures. That would indeed be an ad hominem. Instead, I am talking about what they have done, so it is in no way an ad hominem. Oh, yeah … I’ve asked this a couple times, let me give it one final shot. What I wrote, that no one ever cited your papers, is a fact, anyone can check it in the Web of Science. Whether I give my full name or not is immaterial, I thought we always say what was said is more important than who said it? I did not say anything untrue – it is not an allegation at all (let alone nasty) to denigrate your work. Google Scholar lists 13 citations for my article on sea level rise in Tuvalu, 5 citations for my “Communications Arising” in Nature magazine, and one citation for my paper on the Thunderstorm Thermostat. So either you are mistaken, or you are simply lying when you say that no one ever cited my work. In fact, my work on sea levels was cited by the sea level experts Church and White among others. Willis, The Web of Science is the most trusted citation index by Thomas Reuters. You can check it yourself to confirm whether I am misrepresenting this – only three papers (in Diversity and Distributions (2012), Thunderstorm Thermostat in Energy & Environment (2010), and Nature (2004)) are given there with zero citations. The Tuvalu sea level rise paper in Energy & Environment is somehow not included in the Web of Science. But even if we include that, your H-index is one – I am not sure that will make someone a real scientist. This is not personal opinion, just facts – please check it yourself. On a different issue, Energy & Environment is considered as a journal with a bias and lax review procedures. It is the same journal that published the paper by Ernst Beck on 180 years of CO2; although it required a lot of work to write that article, most scientist will say it is largely meaningless. Your paper on seal level rise in that journal was criticized (just like in this forum) by many others, like http://staff.acecrc.org.au/~johunter/p925.pdf Church & White quotes you suggesting there is controversy, then disagrees with you and Morner. I do not know how that can be taken as a positive thing. Rob, you don’t seem to understand that everything that you say is an ad hominem argument—that my claims are incorrect because I am not a “real” scientist in your eyes … as if that mattered to anyone but you. I’m happy with my work. Yes, there’s not a lot of it, but I have published in the journals. What other amateur scientist can you name who has anything published in the scientific journals, much less Nature magazine? It’s an uphill climb for me to get published because I don’t have a PhD … which makes my publications MORE impressive, not less. Next, the lack of citations of my work is hardly surprising, it goes against the “consensus”, so I’d be surprised if it were cited a lot. But looking at numbers of citations, that’s just another logical fallacy, the “head-count fallacy”. Whether my claims in this or any other study of mine are true or not has nothing to do with whether I’m a “real” scientist in your mind. It has nothing to do with how many times I’ve been published, or how many times they’ve been cited. Science is not a democracy, the validity of claims is not settled by voting as you seem to think. All that matters is whether my claims are true or not … and given that, anyone like you who wants to change the subject to whether I’m a “real” scientist or not is just running from the issues. I trust Willis Eschenbach’s work more than 99% of those with a PhD. He is a real scientist, a man for all seasons, and your opinion is irrelevant. As is your appeal to the consensus. The Climategate emails showed Michael Mann conspiring with Phil Jones to dishonestly inflate the number of Jones’ papers, and Jones went along with it. Those mendacious people publish in the journals they have cowed, and as a result they don’t mean squat. You say, “Energy & Environment is considered as a journal with a bias and lax review procedures.” “Considered” by whom?? By the same dishonest clique that couldn’t corrupt E&E like they corrupted the others? As I’ve often commented, if it were not for psychological projection the alarmist crowd wouldn’t have much to say. That includes you. E&E is a more credible peer review journal than the pet pal review journals used by Mann and Jones. It is scandalous that Mann can get an error-riddled paper published in less than a month, while the esteemed head of MIT’s atmospheric sciences department has to wait more than a year for publication. You seem to have lost your moral bearings, and cannot distinguish right from wrong. Sad, and typical of many climate alarmist lemmings. The paper used questionable data and crappy statistics to “find” a causal relationship between human activities and the “variation” in sea ice. What dark hole did they pull the “human driver” inference out of? You can call that “science” if you want to. I call it putrid crap. Nuff said. Close this troll-laden thread, please. Why WUWT allows fake name commenters is beyond me. Even the local deadtree press requires full real names on Letters to the Editor. I recommend that policy, Anthony. You have nothing to lose but cockroaches. Willis, My original post was just a passing comment, and I never expected it to be a long discussion. I never said your claims are incorrect because you are not a “real” scientist – please read my statements carefully (and please do not add anything more to what I have said). Whatever I said is the truth – I like reading your posts. I do not generally believe you because, as I mentioned earlier, I think you have already made up your mind, which is of course a subjective view after looking at your posts and all your colorful descriptions about scientists you criticize (comments like “Ya think? I love these guys, “possible inconsistency”….). If you are criticizing them only on factual issues in a serious way, probably I would not have come to that conclusion, or made any reference to whether you are a “real” scientist. It is surprising that you take some of my factual statements as ad hominem arguments, when you use extensive colorful teasing to make other scientists with longer credentials appear foolish. That is where I find the problem. Citations have nothing to do with head count fallacy. In general (although not always) citations is a direct measure of the impact, value, correctness, etc of a scientific work – it means that others are using it in some form or other. Richard Lindzen is cited a lot even though his view is not consistent with the scientific majority. Mike Dubrasich, I am not sure Smokey is his/her actual name either – with your plan he will be prevented from posting? I can expand my last name, but how does that help, there are many with that name. Are we then going to ask my phone number too? I do not believe I have said anything improper in my posts, just facts, and never called anyone any “names” (please correct me if I am wrong). While addressing/implying me, I am rather surprised to see words or phrases like “cockroaches”, “putrid crap”, “don’t have the balls”, “coward”, etc. I do not understand what is the source of this hostility and intolerance. Really surprising! Rob, I give up. You seem determined to discuss things like Energy and Environment, Richard Lindzen, Sonja Boehmer-Christiansen, citation counts, whether in your august opinion I’m a “real” scientist, and whether you “believe” me. You’ll discuss anything but the science, it seems. For example, you say you don’t believe me. Is it because you have found some fault in my logic? Is it because you have discovered mathematical errors in my work? No, no, nothing as prosaic as that … it’s because you think I’ve “made up [my] mind”. Made up my mind? Who cares about that? Whether my scientific claims are true has nothing at all to do with whether or not my mind is made up. That’s just a pathetic excuse. Come back when you want to discuss the science. I’m not interested in your whining about how you don’t believe me because you don’t like my colorful descriptions. That just more of your ad hominem nonsense. IT’S NOT ABOUT ME, Rob. It’s not about my language. It’s not about whether my mind is made up, or whether I published in E&E (I did) or Nature magazine (I did). It’s not about Lindzen, or Boehmer-Christiansen. It’s about the science, and it seems that despite several invitations to talk about the science, you’d rather talk about anything but. OK by me … just don’t expect anyone here to do much other than point and laugh when you start ranting about why some paper of Lindzen’s wasn’t accepted and citing, of all things, the New York Times as support for your meaningless claims … the NYT? Bastion of AGW alarmism? That’s your evidence? Be assured, we’re not laughing with you, we’re laughing at you. Willis, Lindzen, E &E, Boehmer-Christiansen, etc came up mainly because Smoky brought it up, I was responding to him or her, and it was mentioned in the section addressed to Smokey. About your blogs, I do not have nearly enough time to work out all the statistical details of your posts to determine whether they are correct or not, I read them because of curiosity – but I have read all your published papers, and after you pointed out that your paper on sea level in E&E was cited by others, I read those papers that cited your work also. Many of them (including Church & White) cited errors in your work and disagreed with your conclusions. (Mike Dubrasich – I do not see any questionable data in Church & White). Some like Rob Dekker criticized your procedures in getting to the conclusion in this topic and elsewhere. So, I am happy on your determination to work in these topics and you are putting so much effort. My hesitation on believing your work, as I repeated before, are the criticisms I read about your work in blogs and other papers and your tone about other scientists. I think they matter to establish credibility. If you show some real respect to other scientists in your blogs, considering that most of them are not all that stupid or dishonest and have similar dedication to work as you have, it will have a significant positive effect. There are so many blogs with posts filled with people with little or no training or background in climate science (as stated in the NY Times article I posted in my last post). Readers do not have time to check all their claims, there are too many – that is where credibility and writing style are important factors. You have said this before in a long advice related to a case where one of the writers did not use paragraphs – where you advised that it is not just what he said that is important, but how he presents it. That is not “ad hominem nonsense” as you suggest, it is just practical reality. One more thing… please just read what you wrote. Instead of looking at what NY Times is saying (they gave enough links to the original sources they used), you dismissed them because it is NY Times. Then how can you complain about my doubts about your blogs? I am doing exactly what you are doing, but in a milder way. At least I read your work and what others are saying about them. Citing the NYT as an authority is not credible: Falsus in uno, falsus in omnibus. We’re still laughing at you. Smokey says: “Citing the NYT as an authority is not credible: Falsus in uno, falsus in omnibus. We’re still laughing at you”. That is OK, I am not too worried about people laughing at me. But what is interesting is that you both think NY Times is not credible (and you do not see any fallacies here) so you dismiss it, but then you find my distrust on Willis’ posts, for similar reasons, to be problematic. Once false, false every time can be applied in both cases. If mine was an ad hominem attack, then what you and Willis are saying contain the same fallacy. At lest NY Times has more credibility among the public. Very interesting. re ‘falsus en uno, etc’ – nobody is laughing. they are conjuring imagery of snickering and sneering and other semiotics that convey nothing but disapproval and that they imagine is a legitimate substitute for a reasoned argument or an honest but curt dismissal. that makes me laugh – but i think retards are nature’s clowns. …what are the error bars on their “internal variability”? Now that we know that your arguments against the variability presented in this paper were caused by you yourself, by disingenuously including the change in seasonal cycle in your presentation of “variability” in figure 1 and 2, it seems that YOU are the one who needs to clarify the error bars in YOUR determination of “internal variability”. And so far, all we have gotten in response is lectures on what “ad hominem” means and chest beating of how much of a scientist you are. If I were interested in assumptions, either yours or theirs, I would have asked for assumptions. If I were interested in error bars on de-trended data, I’d have asked for that. I’m not interested in either one. I’m interested in mathematical calculation of the actual error bars for the data trends and all, not guesses and assumptions. Since neither you nor they have presented error bars, both of you are just blowing smoke. Come back when you have numbers to put where your mouth is. For example, their pre-satellite data only covers the cold half of the PDO … how much has that affected the variability? They don’t say. You don’t say. Instead, you just attack me over and over and over. Finally, it seems you are back to your desperate tactic of calling me deceptive. Rob, I’m presenting the facts as I see them. I have made no effort to hide what I have done. There is nothing at all deceptive in my work. Your continued attempts to paint me as “disingenuous” are just more of your pathetic ad-hominem arguments. Yes, I included “the change in seasonal cycle in your presentation of “variability”. Why? Because there IS a change in the seasonal cycle, which IS a change in variability. I’m sorry you don’t like that, but I described exactly what I did, and I see no theoretical reason to change it. All they offer above is a very basic look at the variability in the detrended records. Please reconsider the meaning of “internal variability”, and then you can explain to us the justification for ignoring trends when you are measuring internal variability. This misunderstanding is particularly important because they claim that the key evidence is that the trend of the satellite era data takes it outside what they ASSUME to be the internal variability of the pre-satellite data … yet they have not included trends in their assessment of internal variability. One more thing… please just read what you wrote. Instead of looking at what NY Times is saying (they gave enough links to the original sources they used), you dismissed them because it is NY Times. If your claim rests on the “original sources they used”, then quote the original sources and leave out the middle-man. Quoting a biased third-hand source just makes folks laugh. Willis, The sources in NY Times relates to Lindzen’s work, that was not included in my answer to you. But I am surprised that you characterized NY Times as a biased source and a “Baston of AGW alarmism”. When you characterized the belief in human caused climate change as alarmism, I am assuming you will probably dismiss the publications of a vast majority of scientists (as you are doing here) many of them with much longer history of reputable research, by creating your own reasons. Most of your objections probably will not get published in real scientific journals. But after accusing NY Times of bias and refusing to look at it, this is what you wrote, “Made up my mind? Who cares about that? Whether my scientific claims are true has nothing at all to do with whether or not my mind is made up. That’s just a pathetic excuse.” The problem is, you excuse is more ”pathetic” since NY Times has more credibility than any one of us. I am surprised you do not see any double standard here. A word about your characterization of alarmism: ignore IPCC but please take a look at the other topics in this: http://en.wikipedia.org/wiki/Scientific_opinion_on_climate_change Are you going to claim that they are all wrong and Willis and few other are correct? Now, you have a point that I am not scientifically criticizing your work, with a full time demanding work it is difficult for me to devote time to do that. But in one of your future post, I will take that up that task as well. Willis, The sources in NY Times relates to Lindzen’s work, that was not included in my answer to you. But I am surprised that you characterized NY Times as a biased source and a “Baston of AGW alarmism”. When you characterized the belief in human caused climate change as alarmism, I am assuming you will probably dismiss the publications of a vast majority of scientists (as you are doing here) many of them with much longer history of reputable research, by creating your own reasons. As usual, when you say “I am assuming” your assumptions are nonsense. You should refrain from assumptions, none of yours so far have been correct. In any case, you still are going on and on about the personalities and your fantasies of what I “dismiss” and the NYT and the like … when are you going to provide a comment about the actual science? Your continuous whining about me and what I might believe is boring. No, that’s YOUR fantasy. I make no such blanket claims. I claim only what I claim, which is not any kind of blanket nonsense of the type you seem to think I follow. Tell me, Rob, how many of these organizations actually polled their members before making the statements, and how many of them are merely the politically correct statements of a few of the leaders? It’s a serious question. Come back when you have the answer. I haven’t found a single organization yet that had the balls to actually poll their members before giving the polloi the benefit of their august soil science or child health or microbiological wisdom about climate, but I might have missed it. They are not only experts on soil, and climate change, but also on the stability of societies … not only that, but they come out foursquare to say the climate is changing. But after accusing NY Times of bias and refusing to look at it, this is what you wrote, “Made up my mind? Who cares about that? Whether my scientific claims are true has nothing at all to do with whether or not my mind is made up. That’s just a pathetic excuse.” The problem is, you excuse is more ”pathetic” since NY Times has more credibility than any one of us. I am surprised you do not see any double standard here. OK by me … just don’t expect anyone here to do much other than point and laugh when you start ranting about why some paper of Lindzen’s wasn’t accepted and citing, of all things, the New York Times as support for your meaningless claims … the NYT? Bastion of AGW alarmism? That’s your evidence? The NYT has been on the global warming bandwagon for years. They just published James Hansen’s op-ed on climate science, and they’ve provided the same bully pulpit to him before … point out to me where they have done the same, provided space in their opinion page, for any noted skeptic like Richard Lindzen or Roger Pielke or Roy Spenser or the like? Never, as far as I know … but you think they’re “credible”. What evidence do you have for that? Finally, I was objecting to you using a newspaper as a citation for a scientific claim … try that in a scientific paper and see how far you get. That’s why I said people would point and laugh, citing a newspaper in support of a scientific claim marks you as a zealot rather than a scientist. Yes, I included “the change in seasonal cycle in your presentation of “variability”. Why? Because there IS a change in the seasonal cycle, which IS a change in variability. No, Willis. It is not a change in ‘variability’. It is a change in ‘trend’. If your definition of ‘variability’ includes the change in trend over the past 30 years, then the Arctic sea ice can melt out completely in September and you would still call it a change in ‘variability’. That excuse does not go too far. On your so called head count fallacy: You are enamored with fallacies and advice others to read on it, but then you are making so many silly mistakes in the process (or you also commit the same fallacy as in the NY Times case). Opinions by experts are exempted from Argumentum Ad Populum (see: http://philosophy.lander.edu/logic/popular.html at the end) – it is only valid for popular opinions, not by people “in-the-know”. I cannot believe you think expert opinions belong to such a fallacy. I am not worried about American Academy of Pediatrics, but the National Academy of Science matters. If I have to read all the papers related to a topic before I do a specific work or develop my belief rather than depending on a expert, I will do very little in my life. Should I read all the papers on beam design, and aging and vibration of beams etc, before I build a new house, or have a trained engineer do that for me; should I read all papers on internal combustion engines before I buy a car, or should I depend on the opinion of a trained auto mechanic; should I cover journal papers on gene expression and recombinant DNA before I eat genetically modified food; should I read thousands of papers on statins before taking Lipitor or cholesterol??? Should a person read all the papers about aerodynamics or structural elasticity, or reliability analysis of every critical component before he gets into a plane (?) – there are strong disagreements on various aspects of the functions of various components. As the exception to the ad populum fallacy, the example is useful – A super majority of scientists and physicians say that high fat diet is unhealthy. There are many who say it is not. There are papers on both sides. To what level would you like to go before you take a side? Read all the papers, one can always find some problems or excuse not to accept the findings in a paper. So should we go one step further and do our own experiments and surveys (and who knows how many errors are there). We depend on experts, and experts do not always agree, and we do not have time to check everything on every topic and do our own experiments. That is not an ad populum fallacy. Most of us do not do such an indepth investigation for more important and critical topics directly related to survival of people. So why should climate science be an exception, compared to other areas? Should I believe the 98 % scientists or a handful of scientists on the other side accompanied with an army of bloggers most of whom with absolutely no training in that area but with lots of time in their hands? Or why should I spend all my time searching the journals on climate science when scientists are already doing that? One more things – sure there are errors in papers and even in our understanding. But other expert scientists will check and find them eventually and that will be corrected. I have a difficult time in assuming that 98 % of the scientists are either incompetant or dishonest (or both), to come up with such an AGW theory. Incompetent? Dishonest? What are you on about? That is the fallacy of the excluded middle. There is a third possibility, that they are just wrong. Not incompetent. Not dishonest. Just wrong. For years, the consensus was that the continents couldn’t move. It took a long time for the idea of continental drift to become established. But contrary to your claim, that didn’t mean that “98 % of the scientists” saying no to continental drift were “either incompetant or dishonest (or both)”. It just meant that they were wrong … all 98% of them … go figure. PS—You can go on and on about the head-count fallacy and the value of consensus for months, I’m sure, particularly since it keeps you from actually addressing the science. You say you don’t have time to address the science, but somehow you find time to make, re-make, and make again your claims about consensus. Let me say it one last time. Science is not settled by consensus. if you are talking about consensus, you are not talking about science. Come back when you want to discuss the science, I’ve had it with you and your consensus. Every time you talk about logical fallacy, unfortunately you are wrong without an exception; so I would very much appreciate if you do not quote from the collection of logical fallacies from freshmen philosophy. If 98 % of the scientists are wrong, and that other 2% are correct, then I would say the 98 % are incompetent in developing a correct understanding of the phenomenon. Looking from the AGW nonbelievers’ perspective, even after repeatedly telling them that they are wrong, these 98 % of scientists keep on arguing from the wrong side bringing even more unreliable evidence – they cannot even understand what is wrong with their theory even though Willis and others are describing that in great detail. That is total incompetence from the 98% group. Since you are making too many mistakes on elementary logic, I am not sure how reliable your science is. But whatever you were discussing here on ice variability is statistics and curve fitting, very little to do with real science. As they say, there is statistics and statistics, which is especially obvious when we see that Rob Dekker has correctly criticized you on your statistics. But, I will be happy to take it up when you deal with real science. Rob, I see it differently. If politics, investment, companies, taxes, freedoms and markets were not involved in this topic I would say great, let’s just wait the some 50-100 years because it is my belief that the 98% will surely be proven wrong, once again. But that too is not the case due to the couple to politics. You are the one seeming to live in an imaginary nana land of science. Science is no longer the pure entity you seem to think it still is. That science died long ago in the 60’s-80’s. If you are anything like a scientist, or even a scientific type mind, it is your command, by science, to always be skeptical of the 98%. You should know Feynman’s great and true saying, do it, in the data, not in the paper’s words. Wayne, I appreciate your experience, although I am not sure it will take that long for our understanding to change. One reliable set of ice data that shows very high CO2 and low temperature (or the opposite – high temperature and low CO2) for a geologically significant period of time will dismantle the entire theory in a hurry. Or reliable evidence that temperature is leading CO2 change will do the same, just like if the net kinetic energy on earth goes down (lowering temp) while CO2 is going up while the other factors are relatively constant for a statistically significant period of time. It is fairly easy to dismantle a theory, we need only one or two convincing deviations. So I am optimistic that it will not take 100 years for a course change, if AGW is not the correct understanding. But help me out in this area, there are several aspects in the AGW theory – CO2 is a greenhouse gas, CO2 is increasing, most of that increase is caused by human activity, there is a positive feedback mechanism, climate sensitivity, average temperature near the earth surface and ocean is rising, rising temperature can melt ice and raise sea levels, and a lot of similar results if AGW is true. Which aspects in this list did you find wrong from your own experience, eg. CO2 is not a greenhouse gas (as many bloggers believe), or CO2 rise is from natural causes (like Roy Spencer or Fred Singer), or the cause of global warming is unknown (like John Christy or Robert Balling), or global warming will have insignificant negative effects (like Patrick Michales),….? If we go with Lindzen, he believes CO2 is a greenhouse gas, CO2 is increasing, and human activity is one the main causes – he only questions the magnitude of climate sensitivity. So which are the wrong components in AGW – I would very much appreciate if you can help me on this. What puzzles me is that this 2 % scientists have different beliefs and conclusions – many of them accepts different components of AGW, but not all the components.From what I see, Willis is attacking all the components whenever it is convenient. Every time you talk about logical fallacy, unfortunately you are wrong without an exception; so I would very much appreciate if you do not quote from the collection of logical fallacies from freshmen philosophy. If 98 % of the scientists are wrong, and that other 2% are correct, then I would say the 98 % are incompetent in developing a correct understanding of the phenomenon. Gosh … so according to you Einstein didn’t just show that the consensus of physicists who believed in Newton was wrong … he showed that they were incompetent or dishonest. And Wallace showed that the consensus that thought continental plates couldn’t move weren’t just wrong, they were incompetent or dishonest as well … who knew that there were that many incompetent geologists? The only two choices that Rob considers are that the scientists are either incompetent or dishonest. But there is a third possibility, which is that they are competent and honest … and wrong. By the exclusion of that possibility, Rob has committed the fallacy of the excluded middle. Instead of facing that obvious fact, he has, hilariously, accused me of being wrong about the nature that particular logical fallacy. You can go on and on about the head-count fallacy and the value of consensus for months, I’m sure, particularly since it keeps you from actually addressing the science. You say you don’t have time to address the science, but somehow you find time to make, re-make, and make again your claims about consensus. Willis, Einstein never showed that Newton was wrong, Newton is correct, has been correct for a long time. We use Newton’s laws for almost all non-relativistic problems – celestial mechanics, fluid mechanics, etc. Einstein found exceptions or modifications for Newton’s law, under certain conditions – such as for objects with very high velocities. I can also talk about Wallace, but let us get to the point. If you are correct and if you are explaining to a climate scientist, who believes in AGW, why he is wrong in great detail using data available to all, and if he still cannot catch what you are saying and why his theory is wrong even after extensive discussions, I would say he is incompetent in this area – he may not know it. On the other hand if AGW is true and after so many explanations if the AGW skeptics cannot understand what the climate scientist who believes in AGW is saying, I would say the AGW skeptics are either incompetent in this area or dishonest because of some bias. We are not talking about generational conflicts in scientific views, sure those who believed that the earth is flat used all their logic with the available evidence to get to that conclusion, that was the best conclusion at that time – I do not consider them to be incompetent at all. But at a specific time in history when new evidence is presented to them that they also can verify to show that earth is not flat, and if they are unable to understand it or refuse to believe it, then they are incompetent in this particular area. There is no fallacy. I was using the same analogy here for climate scientists. I understand where you take an issue (even though I never stated anything in that area) that science is not settled by consensus. My question, as I asked before which you have not addressed, how do you settle science? When there are disagreements on conclusions in most scientific areas (read this for example on a settled theory: http://www.nytimes.com/2012/05/17/health/research/hdl-good-cholesterol-found-not-to-cut-heart-risk.html ), you can evaluate some of the available literature in that area (I am sure you cannot evaluate everything) and you can come to your own conclusion. I am sure the 98 % scientists came to their own conclusions. My question is, why your conclusion is more reliable to yourself and others than other conclusions? Are you suggesting that truth is essentially a personal truth? I am reading Willis’s article and that of some famous climate scientist with a long publication record in this area – if there is significant difference between yours and his conclusions, please give me a reason why I should believe you as opposed to the other fellow? I am not a willing subscriber of science by consensus, but I have not found a good alternative either. If you can give me a good answer here, I would be very happy that I posted that passing short comment that dragged me into this debate. There are not 98% of scientists who believe in Catastrophic Anthropogenic Global Warming. That number is a complete fabrication. There is no empirical data to support that number. It is falsehood. It is propaganda. That’s the problem with authoritarianism. The “authorities” lie. All the time. Case in point: the 98% lie. Why do you bow and scrape to authoritarians, robgee? What’s in it for you? Why do you perpetuate their lies? Big Brother is not going to reward you. You haven’t even got the integrity to identify yourself. I think that since you are hiding your identity, you have much more to hide as well. Dark secrets, eh, robgee? That’s another trait of authoritarians. They have perversities. Often very evil ones. Which is why they sneak around. You’re a sneak, robgee. Must be something you’re hiding. What is it, robgee? I am reading Willis’s article and that of some famous climate scientist with a long publication record in this area – if there is significant difference between yours and his conclusions, please give me a reason why I should believe you as opposed to the other fellow? Fallacy of the excluded middle again. You should not believe either of us. Science is not about belief. Wiilis, I have repeated this question few times, I see you do not want to answer – or you are unable to answer (is there an excluded middle here?). You keep telling me what science is not, but you have not told what science is, although I asked that few times. Let us say science is not consensus, then what is it really? I am appalled at your logical interpretations. In this hypothetical case I took ONE of your papers (let us say, this one states global warming is untrue) and ONE from a leading climate scientist who is opposing your position (saying global warming is true), and I asked you to help me to pick the correct position. One of those views has to be true, there is no excluded middle here. But I think you do not have a guideline or rule as an answer to my question so you go back to this misinterpretation of your list of fallacies again. I expected a lot more, from all the credentials you have claimed – at least please read more on real logic, starting with let us say, counterfacturals (http://web.mit.edu/holton/www/courses/freewill/counter.pdf )? Everything at some level is a belief, but let us not worry about that now. I DID NOT say science is belief in my previous post (you are assigning too many opinions to me that I have not stated as mine). But assume that I am not a scientist and I do not know anything about thermodynamics or kinetics, and I am faced with two opposing views and two papers – I can understand parts of both papers, but not all. Then I have to pick and believe one of those sides, since I do not know how to analyze all those data to pick one side. This is where the belief comes, not as science, but as my option between two sides. Majority of our population is like this hypothetical me, without deep knowledge in scientific disciplines. Mike Dubrasich is a lot more straight forward than you – he did not have any trouble with the excluded middle. Between incompetence and dishonesty, he easily picked dishonesty for scientists – he says “the 98% lie”. No consensus here between you two. Thank you very much, at least you have not designated me as one of the cockroaches, as you did last time. Now, am I hiding something since I did not expand my name? Let us see…. let us look at the names of people who posted above, Manfred, peter, Len, P. Solar, Juraj V, Andrew, The Infidel, Old England, Kasuha, mfo, BioBob, a reader, Jim G, JR, dh7fb, Larry, ……. shall I go on? Many of them are AGW skeptics. You do not worry about them hiding their identify, but this is different. There is a possibility that I could be Kevin Trenberth trying to give trouble to Willis. I may have to hide all my dark secrets. 98 % are not believers of Catastrophic Anthropogenic Global Warming, they believe Anthropogenic Global Warming. Let us not exaggerate, please. BS robgee. Falsehood again. You pulled the 98% number out of a dark hole. You can’t stop lying. Something about you. A glaring lack of integrity. Expand your name? No robgee. Identify yourself. Be real, be honest, stand behind your words like a man. But you are not a man, are you robgee? You are a coward. A pissant. A crackhead. Right? On the buzz. A junky. Typical nazi perv. We get trolls like you all the time. The dregs of society. A looter. A leach on your fellow man. On the dole. Got nothing going on, so you invade the spaces of others to give yourself some partial sense of worth. It won’t work, robgee. We’ve got your number. We see through you. We know what your are. A pathetic creep. Aqualung. Prowling the alleys for whatever evil you can find. A waste of a human life. A danger to others. Bye bye, robgee. We have work to do. No time to parry with a junky in the shadows. I am appalled at your logical interpretations. Now, you have a point that I am not scientifically criticizing your work, with a full time demanding work it is difficult for me to devote time to do that. But in one of your future post, I will take that up that task as well. Since then, despite your claimed lack of time due to your demanding work, you’ve spent pages and pages and lots of time doing nothing but going on and on endlessly about anything but the scientific aspects of my work. Let me make this clear. I don’t care about your theories of science. I am totally uninterested in your ideas about logical fallacies. I couldn’t care less about your brilliant insights into the manifold advantages of scientific consensus. Thus far, you have said nothing about my work. You have not raised a single objection to my claims in the head post. You have not criticized my math, my logic, or my data. Instead, you want to talk about consensus, logical fallacies, the theory of science, hypothetical questions, theoretical dilemmas, anything but the actual subject under consideration which you treat like a vampire treats garlic … and frankly, Scarlett, I don’t give a damn. Willis, I was not the one who brought up these topics in the first place, you did – logical fallacies, consensus, , etc.. you brought them up. My first comment was a very short comment – as I repeatedly said, I was not looking for a debate. But I got one, since you initiated it. Then in the process of defending your criticisms on fallacies, science, etc, I expanded your assertions to show you are completely wrong. You accused me of committing logical fallacies, I did not, I only showed that you are wrong in your claims. But you brought them up to gain an advantage in the debate, I defended to prevent that. There is really no science in the head post, it is statistics and curve fitting, as I said before. When I see a future scientific post from you, I might pick that up. But from all I see, you are more interested in looking at the trees than the forest as a whole. Again, I see what you think science is not, I have not seen anything on what science actually is. Wow…. Oh my… A pissant? I guess that is worse than a cockroach. I have never seen a collection of name calling such as this before. Very original!!!! “You pulled the 98% number out of a dark hole.” No Mike, everything I wrote here has a reference. Check the PANS paper for example on this. ” Expand your name? No robgee. Identify yourself.”, OK – I guess you want my phone number, SS# too, it seems. I am starting to really enjoy your posts. I finally scanned through the Notz and Marotzke paper, your post and all other comments, and I have to disagree with you on your basic premise. We can and we often do compare different data sets based on different measurement procedures to study a substance or a phenomenon. No one will keep the same instrument or measurement methodology for ever (for example, modern methods like XPS took over the old chemical methods to do elemental analysis), so such data set merging is necessary. Researchers do such things for time scales (which is the case here) or length scales (matching different length scales to incorporate smaller length scale phenomenon in larger length scales, like coupling molecular jumps which occurs in Angstrom length scale to a diffusion coefficient in the continuum scale). Of course the calibration and data matching at the overlap domain has to be done carefully, there are problems with resolution/sensitivity of measurements, etc., so it is not so easy to match them, but that does not mean it cannot be done. They are not like apples and oranges,as you say. Peter showed a good example, there are plenty of other examples, I also agree with Rob Dekker’s criticism – which makes perfect sense. Moreover, even if you are correct, I am not sure how your criticisms affect the conclusions in Notz’s paper, which are based on trends, not on variability (they said, “for such an analysis it is instructive to split the satellite record up into two components: a component that is based on the significant negative trend that we have described in section 3, and a component caused by internal variability [cf. Serreze et al., 2007]. Splitting up the satellite record accordingly gives a standard deviation ssat, detrend = 0.35 .10^6 km^2, virtually identical to the value of the pre-satellite record spresat = 0.36 10^6 km^2 ……..”. They also addressed PDO stating “The indices of the Pacific Decadal Oscillation (PDO) (Figure 4d) and of the Arctic Oscillation (AO) (Figure 4e) show only a very weak direct impact on the observed sea-ice retreat”. But your disagreement was on the variability. Although I would like to plot the graphs at the overlap time to see how they matched the two data sets, I do not have enough time to do that. Besides, as you wrote, your criticisms did not arise from detailed statistical analysis, it was mainly based on your disagreements with data set merging. I disagree with that premise (I have done such merging in chemistry, and I belive it can be safely done in other areas as well), so going through the procedure in detail will only illuminate some arithmetical procedural errors, rather than some underlying scientific rules. Also, Ernst Beck has done almost the same matching (“I compared the chemical measurements of atmospheric CO2, represented by the Steinhauser series for 1957/58 in Vienna (Austria), with the IR measurements at Mauna Loa. The average for chemical data for Vienna was 320 ppmv by chemical methods, and this is similar to the 318 ppmv obtained from Mauna Loa. This proves the validity of both types of measurement within the documented error range.” in http://www.biomind.de/treibhaus/180CO2/author_reply9-2.pdf ), and in spite of all the problems in the paper (http://www.biomind.de/nogreenhouse/daten/EE%2018-2_Beck.pdf ), it was a sensational work for the skeptics. So I do not understand the selective objections.